I’m going to try and keep this short because once again I’m going to complain about a topic we’ve discussed several times since My 1-2-3 Cents started. Also, since I’m trying to make 2013 a more positive year, I don’t want to write negative blogs. That said, watching the Rock vs. CM Punk match from Elimination Chamber made me want to bash my head against a wall. On the last episode of RAW before Elimination Chamber, Paul Heyman got Vince McMahon to agree to the stipulation where if Rock got disqualified the WWE title would be awarded to CM Punk. You’d think Heyman got this stipulation added because he had a master plan to help CM Punk regain the title that had been taken from him unjustly. You’d think that, but you’d be wrong based on the events that happened during the match. Before the match started, I was fully expecting The Shield or Brad Maddox or maybe even Brock Lesnar to come down and attack Punk thus getting Rock DQ’d and making Punk champion. This would then lead to Vince McMahon or Vickie Guerrero, or Booker T or Teddy Long or maybe Hornswaggle or anyone else on the WWE payroll that can magically restart matches to come out and say Heyman and Punk couldn’t manipulate the system in such a cheap manner. 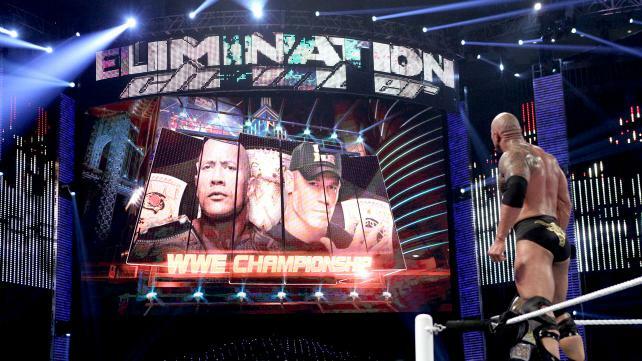 The match would be restarted under protest of Punk and Rock would go on to retain the title. Logical but annoying, no? Instead, the ending of the match involved the referee being distracted by Heyman and having Punk throw Rock into the ref knocking the ref to the floor. A second ref comes out to take over officiating the match until he gets his leg clipped putting his out of action and missing a pin count. Finally after a Rock Bottom, the second ref calls into position and makes the count for a Rock victory. I’m expecting Heyman and Punk to force the original referee to make a delay DQ call tonight on RAW and the events will lead to Punk being added to the Rock/John Cena title match at Wrestlemania. Otherwise the longest reigning WWE champion in the modern era will be going into Wrestlemania in a possible non-meaningful match. The biggest issue I have with how the match played out is the lack of logic. Go back to the match at the Royal Rumble. The stipulation was in place that if the Shield interfered, CM Punk would be stripped of the title. Even though it would cost him the title, the Shield interfered in the match. At Elimination Chamber, the Shield could interfere and help Punk regain the title yet they were nowhere to be seen even though they had been victorious in their match less than an hour earlier and would presumably still be in the arena. Why didn’t they interfere? Why did Heyman have the stipulation added if he wasn’t going to take advantage of said stipulation? I’m curious to see what happens on RAW only because I want to know if WWE can possibly make my interest in Wrestlemania any lower than it is right now. Whatever happens, I won’t be expecting it to be logical or enthralling. And I’m definitely not looking to six weeks of Rock/Cena elementary school level insult promos building to their title match.